The second generation of Apple’s successful iPad and Samsung’s less-than-successful Galaxy Tab range were announced in March 2011, giving consumers a choice of significantly improved products over the models from the previous year. The Apple iPad 2 stole most of the headlines. Much slimmer and lighter than the old model, the iPad 2 was also much faster and also introduced iOS 4.3 which added even more features and polish to an already pretty good device. The iPad 2 added a couple of low-resolution cameras (enabling video calling through FaceTime), something missing completely from the original, although the 9.7” 768 x 1024 pixel display remained. The simple but effective "Smart Covers" also enhanced the usability of the new iPad. Samsung’s response was to create a tablet a little larger than the iPad 2, and one a little smaller. 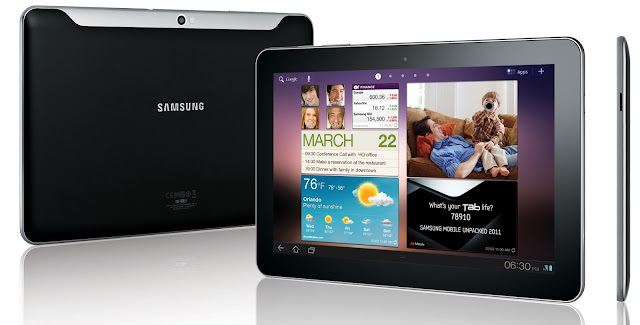 The Samsung Galaxy Tab 10.1 had originally been announced in February, but after the iPad 2 was announced, Samsung engineers redesigned it to be thinner and lighter. The 10.1” display had a 1280 x 800 pixel resolution, better than the iPad, it had much better cameras and was just about as powerful inside. The awful version of Android from the original Galaxy Tab had been dropped and the new Android 3.0 OS had been designed especially for tablets. Launched alongside it was an 8.9” version of the tablet, identical in most respects except it was smaller. Out of the two, it was the Apple device that sold in huge quantities. Samsung had been stung by criticism of the original Galaxy Tab, and it was going to take some time before consumers would trust that they had a quality product. But these two Galaxy Tabs did show that Apple had some real competition. The Apple iPad 2 is still a supported device today, supporting iOS 9.2.1. No matter if you like Apple products or not, they offer excellent support for their gadgets for many years after they were bought. Samsung on the other hand only provided updates until 2012, with a version of Android 4.0... and after that the devices rapidly became obsolete. These days a good used iPad 2 will still cost you around €140, with the Galaxy Tab 10.1 being worth just half of that.